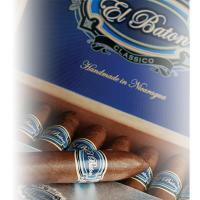 El Baton is the first premium cigar released by the J.C. Newman Cigar Company that is made from 100% Nicaraguan grown, Cuban-seed tobacco. They feature a rare flavorful Corojo wrapper with a medium-to-full body and deliver a rush of pepper and earth overtones with a slight cocoa undertone. Using all long filler, it provides you with a quality smoke with a smooth burn and a bold spicy flavor.